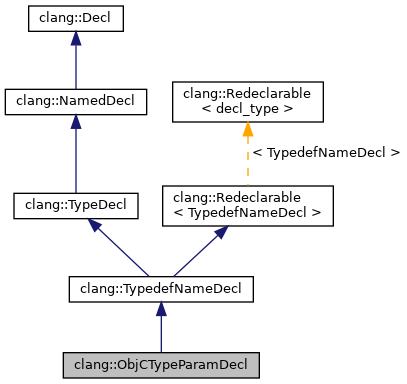 In the example above, both Key and Value are represented by ObjCTypeParamDecl. Key has an explicit bound of id<NSCopying>, while Value gets an implicit bound of id. Definition at line 558 of file DeclObjC.h. Definition at line 625 of file DeclObjC.h. Definition at line 626 of file DeclObjC.h. Definition at line 1384 of file DeclObjC.cpp. Definition at line 1400 of file DeclObjC.cpp. Retrieve the location of the ':' separating the type parameter name from the explicitly-specified bound. Definition at line 622 of file DeclObjC.h. Retrieve the index into its type parameter list. Definition at line 614 of file DeclObjC.h. Definition at line 1408 of file DeclObjC.cpp. References clang::Decl::getEndLoc(), clang::Decl::getLocation(), clang::SourceLocation::getRawEncoding(), and clang::SourceLocation::isInvalid(). Definition at line 601 of file DeclObjC.h. Referenced by sameObjCTypeArgs(), and clang::TextNodeDumper::VisitObjCTypeParamDecl(). Retrieve the location of the variance keyword. Definition at line 611 of file DeclObjC.h. Definition at line 618 of file DeclObjC.h. Set the variance of this type parameter. Definition at line 606 of file DeclObjC.h. Definition at line 585 of file DeclObjC.h. Definition at line 586 of file DeclObjC.h.